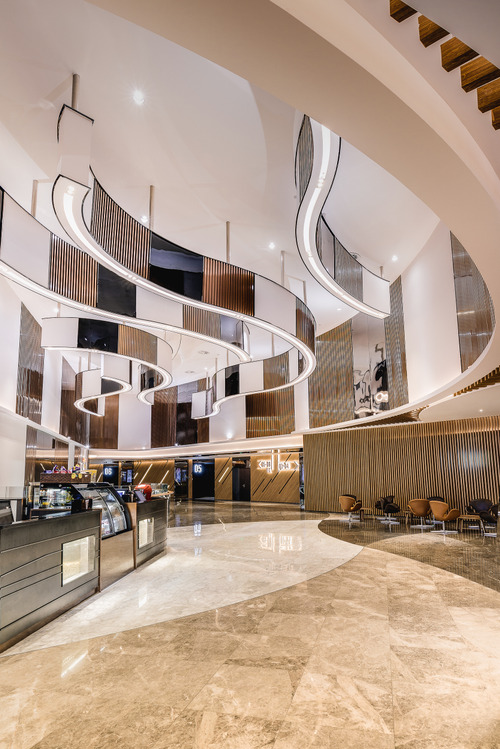 In a world of nature and wildlife, rather than spirits, trees are the most populated beings, which explained why wood and wooden surfaces are the main materials used in this cinema. 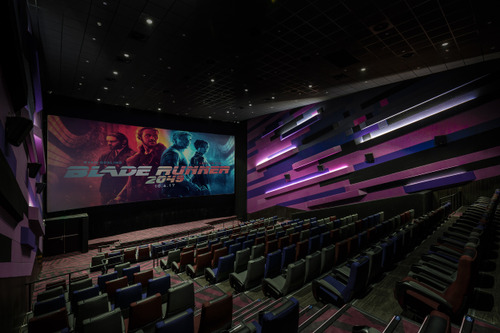 This allows the atmosphere to be as lively as if it could breathe, in sync with inhale and exhale of the audience that entered the cinema. 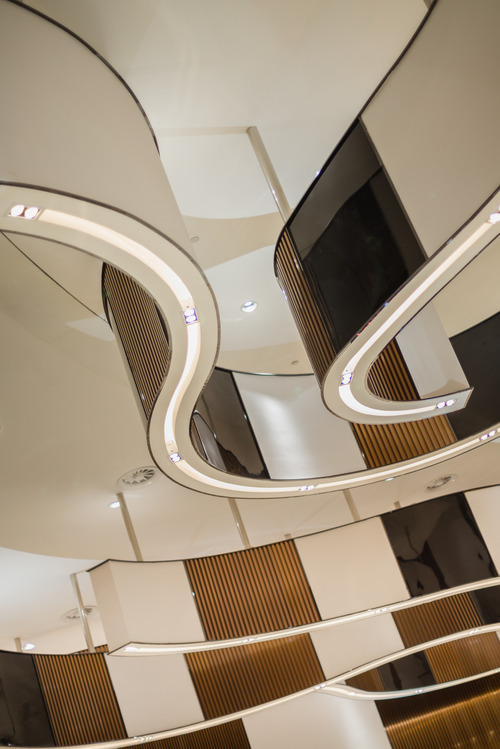 There is a Sacred Tree positioned in the centre of the lobby, created by a ceiling feature with swirling curves. It looks like paper structure, a book of scripts forming curves; but what the curves really depicting are the growth ring of trees. Rounds and rounds of growth ring gave hints about how long the Sacred Tree has stood. The mirrored surfaces of this ceiling feature also depict the fresh dew on leaves, reflecting the surrounding scenery. Soft beige lighting, copper mirrored stainless steel strips and aluminum strips with wood pattern combined to portray the warm shade under trees and beams of sunlight radiating from the sky. At the ticketing counter, there are white transparent rectangular decorations dangled from the ceiling, giving direction to the Sun that is occasionally shaded by tree branches. 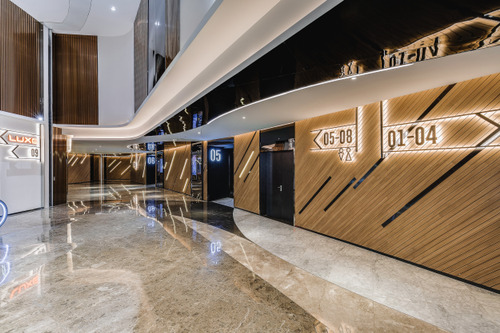 All these features enhanced the vibe of a forest, as the entrance of a cinema, this welcomes audience even more by embracing the nature together. Wondrous creatures and striking images can only be found in the deeper forest, how can one be satisfied without going? Now embark the journey on the forest trail before arriving at the screening houses! 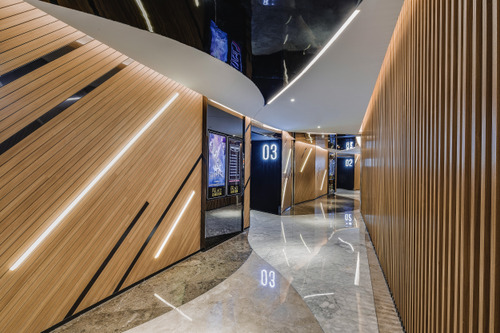 This pathway is made up of wooden strips same as the ones used in the lobby, with soft white lighting hidden in between gaps on the wall for clear guidance to each house. 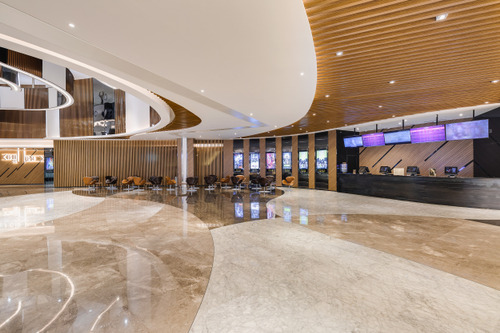 Different colours of marbles are featured on the ceiling and floor finishing, mimicking the harmonious scenery where tree roots meet rocks, where the skyline is not apparent anymore. 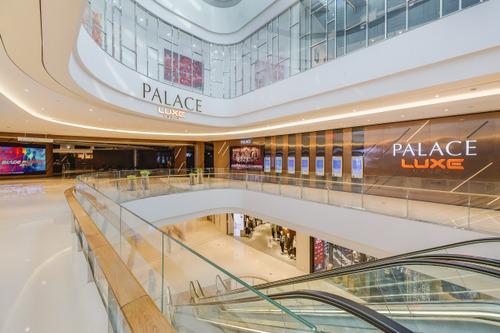 The illuminated signage shines like stars in the sky, showing the exact location of each house in this veering forest trail, in that way, audience wandering through the cinema will not get lost in the forest. 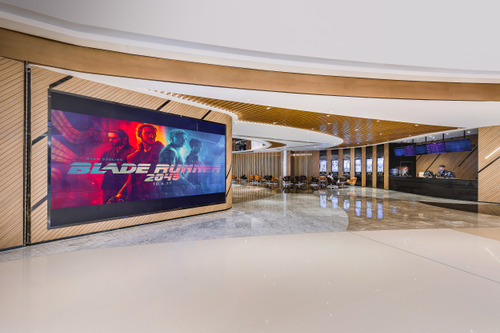 Considering the audience may want to freshen themselves up before entering the houses to watch movies, we designed the lavatory as a use of river or mountain stream for adventurers, so that all forest wanderers get a chance to prepare themselves for the ultimate cinema experience. The lavatory has a significantly brighter lighting compared to the lobby and pathway. The floor finishing has the pattern of river streams made up with marbles, while the toilet doors are featured with wooden surfaced strips. When it is time to go with the flow, audience can glide to the houses next to the lavatory. Two types of houses represent different natural phenomenon. The Standard House represents waterfall and the LUXE House represents gorge. The Standard House is mainly made up of greyish blue and greyish green, with rays of yellowish lighting to portray the mysterious waterfall that cannot be found without an effort of walking miles into the deep forest. 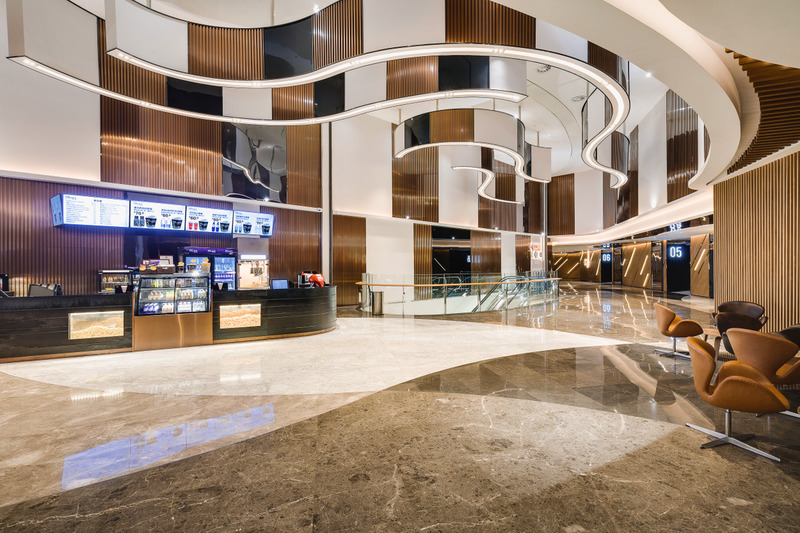 The walls and carpets are patterned with stripes, depicting a cascade of water falling steeply from a certain height. While the LUXE House is mainly made up of dark green, lush green, purple blue and dark brown colours, combining to form dimensions of a great gorge. It is a gorge covered with moss and mist, full of moisture to nurture lives. The stripes on the carpets depicting streams of river are almost as real as if one can hear sounds of the colours. The quiet atmosphere reminds audience that they have come to the spirit’s home, where whispers can be heard: so keep any sounds to yourselves while enjoying the movies!